Yesterday I came across a poem and, reading it, obsessed over its simplicity, its horror, its capacity to make the past breathe (or, more appropriately, choke). Although there are many reasons why one may write poetry, one of the highest, I believe, is to aspire for timelessness. 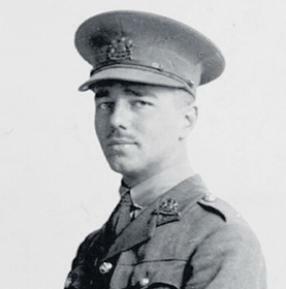 “Dulce et Decorum est” by the WWI-era British soldier Wilfred Owen does that. A few weeks ago I wrote about the centennial of the assassination of Austrian archduke Franz Ferdinand and how it triggered the events that led to World War One. So, it’s in this same spirit I’m posting the work of Owen who, unfortunately, never lived to see much of his poetry published. Sadly, on November 4, 1918, he was killed in the battlefield one week before the Armistice was signed. It’s easy to distance oneself from the past, to see epochs not our own in faded colors, the actors as automatons playing their parts to achieve the present. In some ways, I think this habit is a self-defense mechanism, but I’ll save that for another article (Does this mean the future will forget my own humanity? But everything I do is so important!). But it’s through pieces like this that the snake-trenches across Europe become real. It’s scenes like those in the last stanza that the horrors of war become vivid. Those last lines ought to be remembered by every apologist for armed conflict. Here in the United States, I’m disgusted by how we glorify warfare, how we fantasize over conquering, how buried deep inside each of us, instead of seeing a Mother, a Father, a Child, a Human — we see a Warrior. It’s apparent in the language we use, and it’s apparent in Arlington Cemetery. “What do they mean, anyway?” echoed Ambassador Horlick Minton. “They mean, ‘For one’s country.’ ” And he threw away another line. “Any country at all,” he murmured. “And any country at all” (p.256). All of these dead — whether in the Great or Iraq Wars, whether British or German or Iraqi — these are people, children, murdered in any war for any country at all.